Step in the right direction, but Dunfermline lose out again…. After heavy defeats to both Aberdeen and Kilmarnock, Dunfermline lined up against runaway league leaders Celtic hoping to avoid a repeat of the 8-1 thrashing suffered when the teams last faced each other at East End Park. 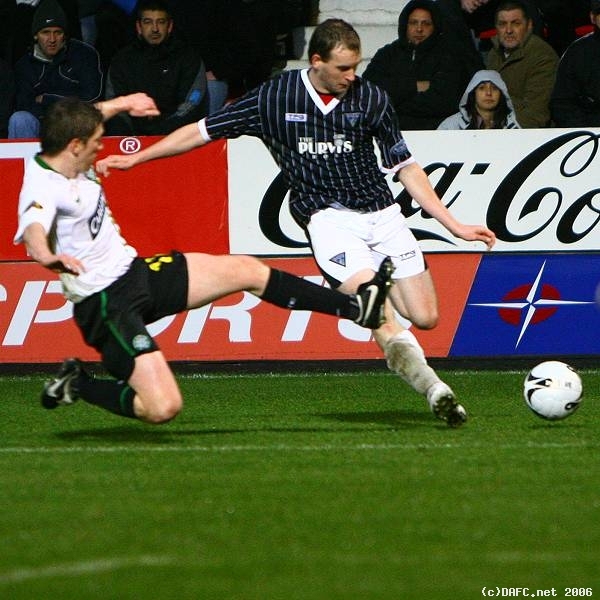 Gary Mason v Neil Lennon. With Sol Bamba red carded after coming on as a substitute last week, the bench had more changes to it rather than the starting line up. Owen Morrison dropped down to the bench, with Aaron Labonte starting at right back. Dorus De Vries continued in goal, with Greg Shields and Scott Wilson forming the centre back pairing. Scott Morrison continued his recovery with another start at left back. The much maligned midfield consisted of Gary Mason, Greg Ross, Scott Muirhead, Stephen Simmons and Freddie Daquin. Stevie Crawford played a predominantly solo role up front, with back up coming in the shape of wide men Daquin and Muirhead. Greg Ross v Jan Jarosik. A truly miserable wet and windy afternoon at East End Park saw Celtic kick off kick towards the Norrie McCathie stand backed up by a strong wind in their favour. 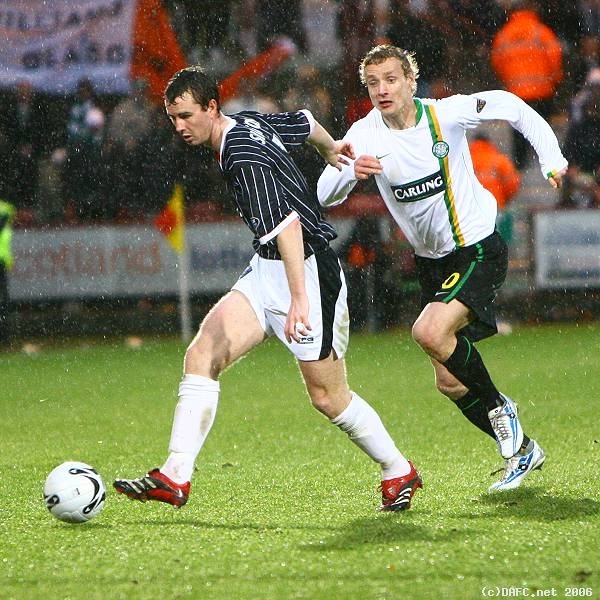 Greg Shields was the first Pars man in action when he managed to injure himself against the post, having cleared an early Celtic attempt at goal. Nakamura was teasing Dunfermline’s defence every time he had the ball, but he was rarely given the opportunity to run with the ball and was closed down more often than not. The game in the first half became a midfield battle with neither side creating clear cut chances as such. Stevie Crawford had what proved to be Dunfermline only real chance of the first half after 25 minutes. With perhaps more space and time than he realised, Crawford snatched at his shot first time and shot high over the bar with Boruc untested. Stevie Crawford v Lee Naylor. The North stand linesman gave little indication of his later ineptitude when he rightly raised the offside flag against Kenny Miller as the Scotland striker had a goal chopped off on the half hour mark. Miller was again the main threat just minutes later when he was given a glorious opportunity from just six yards out. His blasted shot looked goal bound from my view directly behind him, but De Vries somehow reacted with quick hands to turn the piledriver shot over the bar. Stephen Simmons v Jan Jarosik. Dunfermline survived the late onslaught and went into the interval deservedly on level terms after their dogged first half performance. Any words of encouragement and tactical plans for the second half unfortunately went out the window as Celtic broke Dunfermline’s resistance just four minutes into the restart. Irish internation Aiden McGeady turned inside from the left wing and was given a half chance after a long kick by Boruc in the Celtic goal. A seemingly harmless effort curled towards the far post and De Vries appeared to have it safely covered. Alas not as the ball slipped around his grasp and nestled into the bottom corner of the net. 1-0 Celtic. Whilst heads may have gone done after such a cruel blow in the past, Dunfermline battled on whilst again never really threatening the Celtic goal as such. 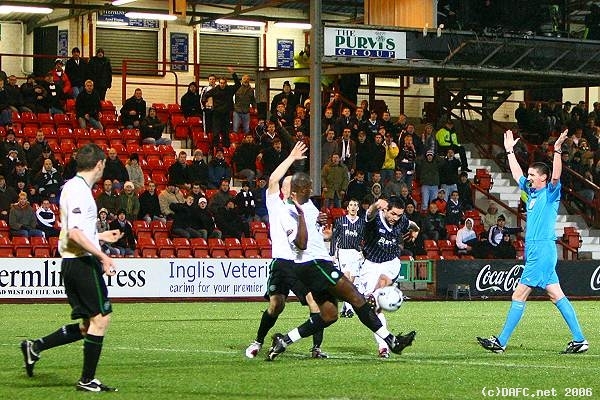 The apparently killer blow came soon after as Maciej Zurawski continued his rich vein of scoring form against The Pars. His turn and shot was a great piece of finishing and one which seemed to wrap the points up for Celtic. 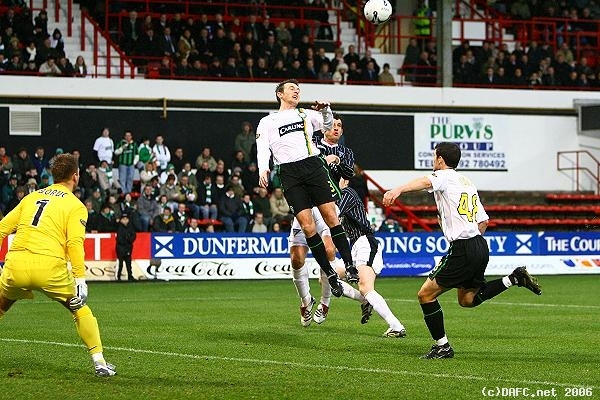 However, the goal came from a free kick awarded by Craig Thomson for an incident that took place directly behind him! Mr Thomson has solved the age old dilemma about referees having eyes on the back of their heads, as he managed to witness a foul whilst running in the opposite direction, quite an achievement. Craig Thomson plays advantage. Not sure if Socks agrees with him though! Sit doon ya radge! Substitutions were then made by both sides, with Stephen Kenny electing to throw Phil McGuire and Mark Burchill back into the action ahead of their anticipated starts against St. Mirren next week. Dunfermline certainly upped their tempo in the latter part of the game and were rewarded in injury time when Stephen Simmons tapped home at the second attempt following a Boruc block. Top v Bottom on Sunday as Pars welcome Celtic!